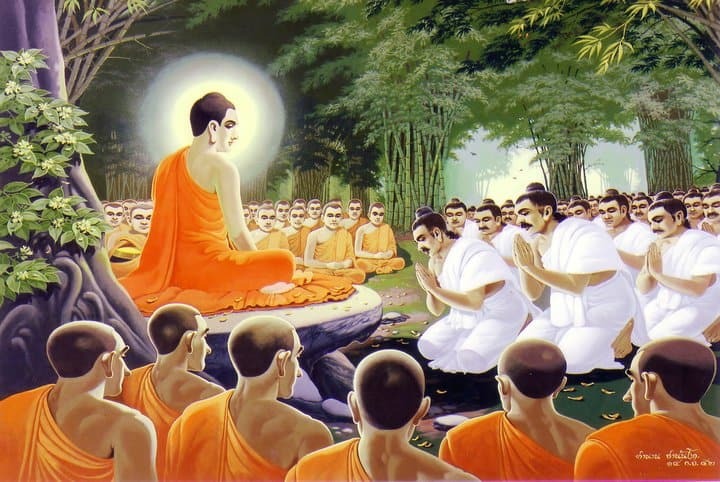 Is the Next Buddha a Sangha? There is a famous calligraphy by Thich Nhat Hanh which translates in English as “The next Buddha will be a Sangha.” Over the months since I began teaching again, one question comes up very often; do I agree with this statement? This is an important question, and an honest answer requires that we embrace a lot of complexity. In 2001, my students and I were living together in a deeply committed spiritual community in western Massachusetts. On July 30th of that year, after many years of dedicated practice, rare commitment, and enormous risks being taken by all, we achieved an extraordinary breakthrough. It was the bursting out of the separate “I” space into the unfettered, brilliant, luminous, ecstatic consciousness of intersubjective non-duality. For over 30 participants, suddenly “I” became “We”. God, or that which is Absolute, was the fully realized nature of each individual. This was a pivotal moment in the evolution of my teaching work. Finally a latent potential I’d been aware of for many years became manifest and realized. What was different about this emergence was that simultaneously each individual was aware of their own uniqueness while remaining fully cognizant of their non-dual essence as Self. Even more extraordinary was that inherent in this intersubjective awareness was the mind of enlightenment itself. Deeply awakened spiritual masters are beacons of the absolute source because their hearts and souls have gained direct access to that same mind of enlightened awareness. When they speak in their role as teacher/guru/master, they are speaking from that source. This is a gift that is usually passed from master to disciple. The miracle of what happened on July 30th is that this direct access to the source of enlightened wisdom itself was present in a shared experience of presence in which all the individuals were immersed. The mind of the Guru had dissolved and had become one with the many. Everybody bore witness as the unique voice of unquestioned spiritual authority spoke through the hearts and minds of many of the individuals present. It was literally awe-inspiring. After this hard won breakthrough I started to think that maybe my role would eventually become superfluous and irrelevant; the mind of enlightenment had now been liberated into the collective. I asked my friend Ken Wilber about this. I was really surprised by his response. In this context, there is an important principle that integral theory teaches us: that the absolute height or ceiling to which any collective is capable of rising will always be determined by the most evolved or developed individual in the group. The main predicament of the old guru system, and the reason why it has become so dysfunctional in postmodernity, is that it clings to some significant delusions. In the mythic cultural context from which it emerged, the one who had realized the palpable divinity or “holiness” was automatically assumed to be perfect; without shadow, whole, and free from any kind of moral contradictions, gross or subtle. The great emergence of individuality that postmodernity gave rise to, and the vastly expanded context that is the gift of integral philosophy, has enabled us to see more clearly the overwhelming complexity that makes up each and every one of us as human beings. I’ve paid a very high price to understand this at the level of my soul. I had a very powerful experience of transformation when I met my guru, H.W.L Poonja, in 1986. After this he told me in many different ways that I was God’s gift to humanity. Then when I began to teach, people were literally falling at my feet because of the impact my presence had on them. In the midst of all this I had an unconscious need for others to see me as being perfect. My new mythic identity reinforced this, and it was constantly reflected back to me. Simultaneously I was deluded enough to actually believe the impossible: that I had no shadow. Integral psychology has revealed to us that everyone has shadow, including enlightened spiritual masters. Why have so many of the boldest and brightest utopian spiritual experiments crashed and burned? Because sooner or later, under the complex and discriminating gaze of postmodernity, the mythic illusion of human perfection is going to be broken. That being said, we don’t all have the same “Kosmic address”. Some human beings, as a result of very hard work or grace or both, achieve and realize greater spiritual depth. Just as we don’t all have the same level of emotional or cognitive development, so we are not all at the same level of spiritual development. Postmodern sensibilities find it abhorrent when these kind of distinctions in spiritual depth and complexity are made in relationship to human beings. But if we don’t find a way to honor the actual differences that exist within and between us, it is likely that spirit will remain forever trapped in flatland metaphysics.